In the words of the A-Team’s indomitable leader, Hannibal, I love it when a plan comes together. I also love it when new birders come together. It all came together for me this past weekend, at least in terms of birding. The plan was first set in motion, though I didn’t know it at the time, when I contacted Debra Ross, the genius behind Rochester’s kid-centric event resource, KidsOutAndAbout.com. Deb and I were in touch back when I first moved to our fair Flour City but hadn’t, despite my best intentions, spoken since. My agenda was business-related but I was pleased to learn that Deb still read 10,000 Birds. Even better, she wanted to go birding, particularly because she’d never seen Short-eared Owls before. Even more better (!) Deb was friendly with Laura Kammermeier and wondered if we’d be including her too. All at once, a plan came together that entailed me, Seth, my new birding friend, and my lucky owl friend all headed down to Doran Road to search out owls. Allow me to cut to the chase: yes, we spotted our target owls, along with the expected Northern Harriers, American Tree Sparrows, and not a whole heck of a lot else. Drizzle set in as soon as we arrived, followed swiftly by dusk. As a consequence, though we saw as many as four distant owls in flight at one time, I returned with no usable photos. I’d rather have the owls, as I’m sure you’d agree. I anticipate assembling this crack team of owl chasers for a saw-whet sally in early spring. One birding venture begat another, as my son felt a bit bruised at being left behind. 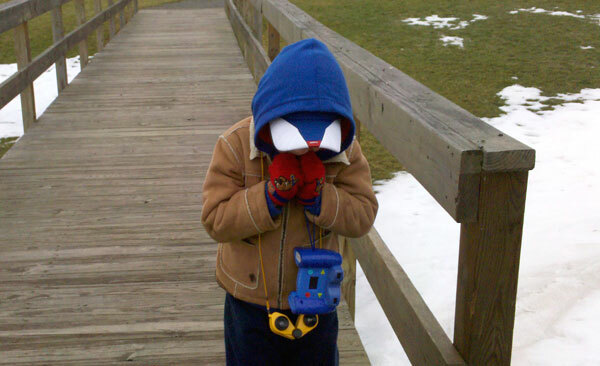 To make it up to my little man, I invited Seth to accompany the two of us for some MLK-Day birding. Our destination was Buckland Park, a fantastic recreational space with terrific playscapes for the kiddies and tall grass for harriers and Wild Turkeys. 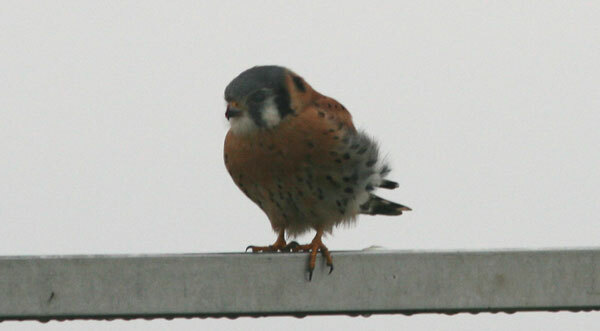 We saw neither of those stalwarts but did luck into a fetching American Kestrel perched on a soccer net. A cold wind cut across the park’s pancake flat landscape, slicing Mason’s probable interest in this endeavor from the anticipated ten minutes down to a more likely five or fewer. The absence of avians other than Mourning Doves didn’t help either. We tried to make something else happen but our most interesting sighting apart from the kestrel was a couple of owl pellets. Seth and I will surely scope that spot out again, but I suspect Mason will be staying home! Saw-whet Sally; I think I knew her back in Vegas.